CAST: Alec Baldwin, Miles Christopher Bakshi, Steve Buscemi, Jimmy Kimmel, Lisa Kudrow, Tobey Maguire, ViviAnn Yee, Eric Bell Jr.
It’s going to sound cruel, but it’s true: whoever’s in charge of DreamWorks Animation’s marketing department seriously needs to be fired, like right now. For the last few years, the trailers for all of their films have been utterly abysmal, to a point where they do the exact opposite of their job and make the film look far worse than it actually is, whether it be Kung Fu Panda 3, Trolls, and I’m guessing their next film due out later this summer, Captain Underpants. But somehow, they managed to outdo themselves with all the trailers for The Boss Baby, a movie which initially sounded dead on arrival – and with a title like that, would you really think it had anything of value? – and whose publicity material seemed to prove everyone’s fears. But in perhaps a huge surprise to almost everyone who walks the Earth, The Boss Baby is not only far better than the trailers make it out to be, but is far cleverer and funnier than a film entitled The Boss Baby has any right to be. The film sees an adult narrator (Tobey Maguire) telling us the story of when he was a young boy by the name of Tim Templeton (Miles Christopher Bakshi), who we already see has an extraordinarily active imagination as he’s playing with his parents (Jimmy Kimmel and Lisa Kudrow). His happiness soon changes, however, with the mysterious arrival of a smooth-talking, high-maintenance baby (Alec Baldwin) who wears a business suit and carries a briefcase, whom Tim immediately distrusts. Upon closer investigation, Tim discovers that his new little brother actually works for a baby-producing corporation that has sent him on a mission to prevent the cuteness of babies from being overtaken by puppies, particularly by a puppy company that Tim’s parents work for. Both Tim and the “Boss Baby” must now work together if they are to stop the cuteness balance from being disrupted, and you’ll be surprised that even with a story as silly and ridiculous as this, it never entirely goes off the rails. Tom McGrath, the director of the Madagascar films, is the boss of The Boss Baby, and as he did with those movies McGrath leans heavily towards Tex Avery-style cartoon slapstick and increasingly bizarre world-building to carry this particular story, but is also reasonably smart with his usage. It’s established very early on that Tim is an unreliable narrator, as we see his wild imagination in full swing with fantasy sequences set to some rather stylish animation, which depict scenarios and make-believe worlds that would not be out of place in this “real” universe that’s happening around the main story. In a way, it’s also got something in common with The LEGO Movie, as it constantly feels like you’re inside the head of a creative young child as he’s making up this increasingly silly story as he goes along. This helps excuse some of the more out-there plot developments which already feel appropriately childish, and there’s an underlying smartness to the fact that what we are seeing may or may not be really happening; I never thought I’d say this, but The Boss Baby might actually be DreamWorks Animation’s version of Total Recall… believe me, I’m having a hard time coming to terms with this myself! There were times when I seriously couldn’t believe I was actually enjoying myself while watching this; I wanted to feel guilty about it immediately afterwards, but I never did. I found myself chuckling out loud at some of the well-timed jokes and moments of physical humour (even the film’s sole fart joke got me, which sums up the power of this film neatly), I found myself being invested in the characters and the beating heart at the centre of it all, and I even found myself, for once in so goddamn long, genuinely loving Alec Baldwin’s fun-fuelled commitment to such a role (not including playing Donald Trump on Saturday Night Live). 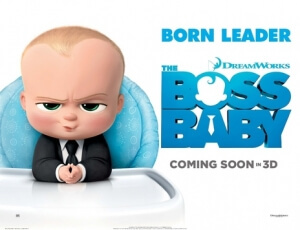 For a film that I was dreading from the moment I heard that terrible title show up on DreamWorks Animation’s release schedule, it managed to truly surprise me with how funny, smart and investing it was… again, all from a film entitled The Boss Baby. There are, thankfully, some parts of it that don’t entirely work; the film moves at such a fast pace that it barely takes enough time to calm down and develop some of its jokes or characters, leaving you exhausted by the time it’s about ready to transition from the second to third act; and the ending will divide some people, with its questioning “gotcha” moment right as it fades to black. Personally, I came to a conclusion that made a bit more sense, but others might not be so fortunate and may choose to feel as if those closing moments ruined the film for them completely, for which I would certainly understand if it was the case (obviously I won’t give it away here, but you’ll know it when you see it). If you do decide to see it, and I recommend you do – especially if you’ve got a kid or two that needs some non-derivative entertainment for an hour and a half – then know that the trailers do not represent what this movie actually is. Again, I feel bad for saying this, but whoever is in charge of DreamWorks Animation’s trailer division seriously needs to be sacked so that their movies can actually make an early impression again – because The Boss Baby, terrible title aside, does not deserve that treatment. The Boss Baby is a shockingly decent family comedy with some strong laughs, smart underlying themes, and a gleeful ode to a child’s vivid imagination, all things that the abysmal trailers fail to market properly, and are bound to surprise all those going in who already think they know what they’re in store for.